Superior first year bloom, use by itself for an easy quick wildflower patch or to enhance fading perennial stands or add interest in new perennial plantings. 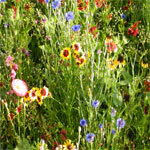 Annual Wildflower Mix will produce a rainbow of color on blooms ranging from 8 to 36 inches tall. Adapts to moist or dry soils and partital sun to full sun exposure. Colors include Red, Blue, White, Yellow, Purple, and Orange. Approximately 251,000 pure live seeds per pound. Seeding rate: 3-5 oz./1,000 sq ft., or 8-14 lbs./acre. Please call us at 800-622-4727 or email info@arrowseed.com to order! Mixture includes: Baby’s Breath, Partridge Pea, Scarlet Flax, Cornflower, California Poppy, Dame’s Rocket, Clasping Coneflower, Catchfly, Lemon Mint, Dwarf Red Plains Coreopsis, Plains Coreopsis, and Annual Gaillardia.